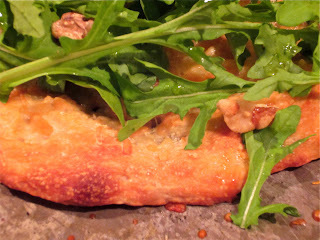 "I have some super pizza snob friends that would scoff at me for using pre-made dough, but hey, this awesome white arugula and walnut pizza too me all of about 5 minutes to prep and 5 minutes to bake. I love Trader Joe's pizza dough. You can make all sorts of stuff with it like calzones, veggie hot pockets, wrapped tofu dogs, breadsticks, etc. The list goes on and on. They have a whole wheat version too which is great in the fall when pumpkins and squashes are in season. Pumpkin hot pockets! Yum!" Call me skinny, but dough-n't you know how cool Trader Joe's fans are? ?